Among the promised fruits of nanotechnology, small machines have always stood out. Their attraction is straightforward. Large machines--airplanes, submarines, robotic welders, toaster ovens--are unquestionably useful. If one could take the same ideas used to design these devices and apply them to machines that were a tiny fraction of their size, who knows what they might be able to do? Imagining two types of small machines--one analogous to an existing machine, the second entirely new--has captured broad attention. The first is a nanoscale submarine, with dimensions of only a few billionths of a meter--the length of a few tens or hundreds of atoms. This machine might, so the argument goes, be useful in medicine by navigating through the blood, seeking out diseased cells and destroying them. WHIPLIKE TAILS, found on many bacteria, are propelled by nanomotors. 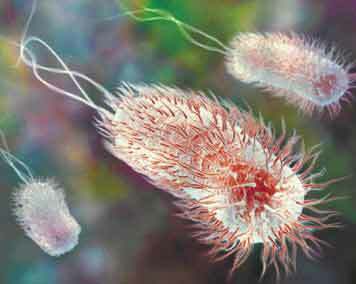 The tiny biochemical motor turns a rotary shaft that spins the tails, or flagella, and allows the bacteria, such as these E. coli, to move through liquid. The second--the so-called assembler--is a more radical idea, originally proposed by futurist K. Eric Drexler. This machine has no macroscopic analogue (a fact that is important in considering its ultimate practicality). It would be a new type of machine--a universal fabricator. It would make any structure, including itself, by atomic-scale "pick and place": a set of nanoscale pincers would pick individual atoms from their environment and place them where they should go. The Drexlerian vision imagines society transformed forever by small machines that could create a television set or a computer in a few hours at essentially no cost. It also has a dark side. The potential for self-replication of the assembler has raised the prospect of what has come to be called gray goo: myriads of self-replicating nanoassemblers making uncountable copies of themselves and ravaging the earth while doing so. Does the idea of nanoscale machines make sense? Could they be made? If so, would they be effectively downsized versions of their familiar, large-scale cousins, or would they operate by different principles? Might they, in fact, ravage the earth? We can begin to answer these intriguing questions by asking a more ordinary one: What is a machine? Of the many definitions, I choose to take a machine to be "a device for performing a task." Going further, a machine has a design; it is constructed following some process; it uses power; it operates according to information built into it when it is fabricated. Although machines are commonly considered to be the products of human design and intention, why shouldn't a complex molecular system that performs a function also be considered a machine, even if it is the product of evolution rather than of design? The charm of the assembler is illusory: it is more appealing as metaphor than as reality, and less the solution of a problem than the hope for a miracle. Issues of teleology aside, and accepting this broad definition, nanoscale machines already do exist, in the form of the functional molecular components of living cells--such as molecules of protein or RNA, aggregates of molecules, and organelles ("little organs")--in enormous variety and sophistication. The broad question of whether nanoscale machines exist is thus one that was answered in the affirmative by biologists many years ago. The question now is: What are the most interesting designs to use for future nanomachines? And what, if any, risks would they pose? Cells include some molecular machines that seem similar to familiar human-scale machines: a rotary motor fixed in the membrane of a bacterium turns a shaft and superficially resembles an electric motor. Others more loosely resemble the familiar: an assembly of RNA and protein--the ribosome--makes proteins by an assembly line–like process. And some molecular machines have no obvious analogy in macroscopic machines: a protein--topoisomerase--unwinds double-stranded DNA when it becomes too tightly wound. The way in which these organelles are fabricated in the cell--an efficient synthesis of long molecules, combined with molecular self-assembly--is a model for economy and organization, and entirely unlike the brute-force method suggested for the assembler. And as for ravaging the earth: in a sense, collections of biological cells already have ravaged the earth. Before life emerged, the planet was very different from the way it is today. Its surface was made of inorganic minerals; its atmosphere was rich in carbon dioxide. Life rapidly and completely remodeled the planet: it contaminated the pristine surface with microorganisms, plants and organic materials derived from them; it largely removed the carbon dioxide from the atmosphere and injected enormous quantities of oxygen. Overall, a radical change. Cells--self-replicating collections of molecular nanomachines--completely transformed the surface and the atmosphere of our planet. We do not normally think of this transformation as "ravaging the planet," because we thrive in the present conditions, but an outside observer might have thought otherwise. So the issue is not whether nanoscale machines can exist--they already do--or whether they can be important--we often consider ourselves as demonstrations that they are--but rather where we should look for new ideas for design. Should we be thinking about the General Motors assembly line or the interior of a cell of E. coli? Let's begin by comparing biological nanomachines--especially the ultimate self-replicating biological system, the cell--with nanoscale machines modeled on the large machines that now surround us. How does the biological strategy work, and how would it compare with a strategy based on making nanoscale versions of existing machines, or a new strategy of the type suggested by the assembler? The cell is a self-replicating structure. It takes in molecules from its environment, processes some of them for fuel, and reworks others into the pieces it uses to make, maintain, move and defend itself. DNA stores the information needed for fabrication and operation from one generation to the next. One kind of RNA (messenger RNA, or mRNA) serves as the temporary transcript of this information, "telling" ribosomes which protein to make. Membranes provide compartments that enclose the working parts, house portals that control the flux of molecules into and out of the cell, and hold molecules that sense the cell's environment. Proteins (often cooperating with other molecules) build everything in the cell and move its parts when they must be moved. STANDARD-ISSUE electric motor bears a superficial--albeit striking--resemblance to the biochemical rotary motor (top right) that turns the flagella in a bacterium. The strategy adopted by the cell to make its parts--and thus to replicate and maintain itself--is based on two ideas. The first is to use a single, conceptually straightforward chemical process--polymerization--to create large, linear molecules. The second is to build molecules that spontaneously fold themselves into functional, three-dimensional structures. This two-part strategy does not require a difficult and sophisticated three-dimensional pick-and-place fabrication: it simply strings beads (for example, amino acids) together into a necklace (a polypeptide) and lets the necklace self-assemble into a machine (a protein). Thus, the information for the final, functional, three-dimensional structure is coded in the sequence of the beads. The three most important classes of molecules in the cell--DNA, RNA and proteins--are all made by this strategy; the proteins then make the other molecules in the cell. In many instances proteins also spontaneously associate with other molecules--proteins, nucleic acids, small molecules--to form larger functional structures. As a strategy for building complex, three-dimensional structures, this method of linear synthesis followed by various levels of molecular self-assembly is probably unbeatable for its efficiency. The cell is, in essence, a collection of catalysts (molecules that cause chemical reactions to occur without themselves being consumed) and other functional species--sensors, structural elements, pumps, motors. Most of the nanomachines in the cell are thus, ultimately, molecular catalysts. These catalysts do most of the work of the cell: they form the lipids (fats, for instance) that in turn self-assemble into the flexible sheet that encloses the cell; they make the molecular components necessary for self-replication; they produce the power for the cell and regulate its power consumption; they build archival and working information storage; and they maintain the interior environment within the proper operating parameters. Among the many marvelous molecular machines employed by the cell, four are favorites of mine. The ribosome, made of ribosomal RNA (rRNA) and protein, is a key: it stands at the junction between information and action--between nucleic acids and proteins. It is an extraordinarily sophisticated machine that takes the information present in mRNA and uses it to build proteins. Considering the many constraints on the construction and operation of nanomachines, it seems that new systems for building them might ultimately look much like the ancient systems of biology. The chloroplast, present in plant cells and algae, is a large structure that contains arrays of molecules that act as tuned optical antennas, collect photons from sunlight and employ them to generate chemical fuel that can be stored in the cell to power its many operations. The chloroplast, incidentally, also converts water to the oxygen that so contaminated the atmosphere when life first emerged: the stuff on which our lives depend was originally a waste product of cellular light-harvesting! The mitochondrion is the power station: it carries out controlled combustion of organic molecules present in the cell--typically glucose--and generates power for the system. Instead of pumping electrons through wires to run electric motors, it generates molecules of ATP that move through the cell by diffusion and that are essential contributors to many biological reactions. The flagellar motor of bacteria is a specialized but particularly interesting nanomachine, because it seems so similar to human-scale motors. The flagellar motor is a highly structured aggregate of proteins anchored in the membrane of many bacterial cells that provides the rotary motion that turns the flagella--the long whiplike structures that act as the propeller for these cells and allow them to propel themselves through water. It has a shaft, like an electric motor, and a structure around the shaft, like the armature of a motor. 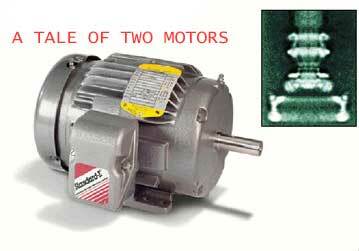 The similarity between flagellar and electrical motors is, however, largely illusory. The flagellar motor does not act by using electric current to generate moving magnetic fields; instead it uses the decomposition of ATP to cause changes in the shape of the molecules that, when combined with a sophisticated molecular ratchet, make the protein shaft revolve. Can we ever approach the elegant efficiency of cellular nanomachines by creating tiny cousins of the larger machines we have invented? Microfabrication has developed as an extraordinarily successful technology for manufacturing small, electronically functional devices--transistors and the other components of chips. Application of these techniques to simple types of machines with moving parts--mechanical oscillators and movable mirrors--has been technically successful. The development of these so-called microelectromechanical systems (MEMS) is proceeding rapidly, but the functions of the machines are still elementary, and they are micro, not nano, machines. The first true nanoscale MEMS (NEMS, or nanoelectromechanical systems) have been built only in the past few years and only experimentally [see "Plenty of Room, Indeed," on page 48]. Many interesting problems plague the fabrication of nanodevices with moving parts. A crucial one is friction and sticking (sometimes combined in talking about small devices in the term "stiction"). Because small devices have very large ratios of surface to volume, surface effects--both good and bad--become much more important for them than for large devices. Some of these types of problems will eventually be resolved if it is worthwhile to do so, but they provide difficult technical challenges now. We will undoubtedly progress toward more complex micromachines and nanomachines modeled on human-scale machines, but we have a long path to travel before we can produce nanomechanical devices in quantity for any practical purpose. Nor is there any reason to assume that nanomachines must resemble human-scale machines. 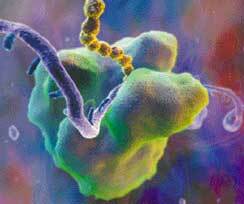 RIBOSOME reads along a strand of RNA (purple) to get instructions for stringing together the amino acids that constitute a protein (gold). 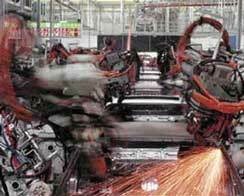 This assembly-line process brings to mind the robotic welders in an automotive factory (below). Could these systems self-replicate? At present, we do not know how to build self-replicating machines of any size or type. We know, from recent biological studies, something about the minimum level of complexity in a living cell that will sustain self-replication: a system of some 300 genes is sufficient for self-replication. We have little sense for how to translate this number into mechanical machines of the types more familiar to us, and no sense of how to design a self-sustaining, self-replicating system of machines. We have barely taken the first steps toward self-replication in nonbiological systems [see "Go Forth and Replicate," by Moshe Sipper and James A. Reggia; Scientific American, August]. And other problems cast long shadows. Where is the power to come from for an autonomous nanomachine? There are no electric sockets at the nanoscale. The cell uses chemical reactions of specific compounds to enable it to go about its business; a corresponding strategy for nanoscale machines remains to be developed. How would a self-replicating nanomachine store and use information? Biology has demonstrated a strategy based on DNA, so it can be done, but if one wanted a different strategy, it is not clear where to start. The assembler, with its pick-and-place pincers, eliminates the many difficulties of fabricating nanomachines and of self-replication by ignoring them: positing a machine that can make any composition and any structure by simply placing atoms one at a time dismisses the most vexing aspects of fabrication. The assembler seems, however, from the vantage of a chemist, to be unworkable. Consider just two of the constraints. First is the pincers, or jaws, of the assembler. If they are to pick up atoms with any dexterity, they should be smaller than the atoms. But the jaws must be built of atoms and are thus larger than the atom they must pick and place. (Imagine trying to build a fine watch with your fingers, unaided by tools.) Second is the nature of atoms. Atoms, especially carbon atoms, bond strongly to their neighbors. Substantial energy would be needed to pull an atom from its place (a problem for the energy supply) and substantial energy released when it is put in place (a problem of cooling). More important, a carbon atom forms bonds with almost everything. It is difficult to imagine how the jaws of the assembler would be built so that, in pulling the atoms away from their starting material, they would not stick. (Imagine trying to build your watch with parts salvaged from another watch in which all the parts were coated with a particularly sticky glue: if you could separate the pieces at all, they would stick to your fingers.) Problems with the assembler are also discussed by Richard E. Smalley in his essay on page 76. Would a nanosubmarine work if it could be built? A human-scale submarine moves easily in water by a combination of a rotating propeller--which, in spinning, forces the water backward and the submarine forward--and movable planes that guide its direction. Bacteria that swim actually use structures--flagella--that look more like flexible spirals or whips but serve a function similar to a propeller. They typically do not steer a very purposeful path but rather dash about, with motion that, if all goes well, tends in the general direction of a source of food. For nanoscale objects, even if one could fabricate a propeller, a new and serious problem would emerge: random battering by water molecules. These water molecules would be smaller than a nanosubmarine but not much smaller, and their thermal motion is rapid on the nanoscale. Collisions with them make a nanoscale object bounce about rapidly (a process called Brownian motion) but in random directions: any effort to steer a purposeful course would be frustrated by the relentless collisions with rapidly moving water molecules. Navigators on the nanoscale would have to accommodate to the Brownian storms that would crash against their hulls. For ships of approximately 100 nanometers in scale, the destination of most voyages would be left to chance, because the tiny craft would probably be impossible to steer, at least in a sense familiar to a submariner. Cells in the bloodstream--objects 10 or 100 times more massive than a nanosubmarine--do not guide themselves in it: they simply tumble along with it. At best, a nanosubmarine might hope to select a general direction but not a specific destination. Regardless of whether one could make or steer devices at the nanoscale, they would not work for the sophisticated tasks required to detect disease if one could make them. Parts of the "little submarine" strategy for detecting and destroying diseased cells in the body, such as cancer cells, would have to focus on finding their prey. In doing so, they would probably have to mimic aspects of the immune system now functioning in us. The recognition of a cell as "normal" or "pathogen" or "cancer" is an extraordinarily complex process--one that requires the full panoply of our immune system, including the many billions of specialized cells that constitute it. No simple markers on the outside of most cancer cells flag them as dangerous. In many of their characteristics, they are not enormously different from normal cells. A little submarine that was to be a hunter-killer for cancer cells would have to carry on board a little diagnostic laboratory, and because that laboratory would require sampling devices and reagents and reaction chambers and analytical devices, it would cease to be little. Operating this device would also require energy. The cells of the immune system use the same nutrients as do other cells; a little submarine would probably have to do the same. Small machines will eventually be made, but the strategy used to make them, and the purposes they will serve, remain to be devised. Biology provides one brilliantly developed set of examples: in living systems, nanomachines do exist, and they do perform extraordinarily sophisticated functions. What is striking is how different the strategies used in these nanometer-scale machines are from those used in human-scale machines. It will be a marvelous challenge to see if we can outdesign evolution. It would be a staggering accomplishment to mimic the simplest living cell. In thinking about how best to make nanomachines, we come up against two limiting strategies. The first is to take existing nanomachines--those present in the cell--and learn from them. We will undoubtedly be able to extract from these systems concepts and principles that will enable us to make variants of them that will serve our purposes, and others that will have entirely new functions. Genetic engineering is already proceeding down this path, and the development of new types of chemistry may enable us to use biological principles in molecular systems that are not proteins and nucleic acids. The second is to start from scratch and independently to develop fundamental new types of nanosystems. Biology has produced one practical means for fabrication and synthesis of functional nanomachines, and there is no reason to believe that there cannot be others. But this path will be arduous. Looking at the machines that surround us and expecting to be able to build nanoscale versions of them using processes analogous to those employed on a large scale will usually not be practical and in many cases impossible. Machining and welding do not have counterparts at nanometer sizes. Nor do processes such as moving in a straight line through a fluid or generating magnetic fields with electromagnets. Techniques devised to manufacture electronic devices will certainly be able to make some simple types of mechanical nanodevices, but they will be limited in what they can do. The dream of the assembler holds seductive charm in that it appears to circumvent these myriad difficulties. This charm is illusory: it is more appealing as metaphor than as reality, and less the solution of a problem than the hope for a miracle. Considering the many constraints on the construction and operation of nanomachines, it seems that new systems for building them might ultimately look much like the ancient systems of biology. It will be a marvelous challenge to see if we can outdesign evolution. It would be a staggering accomplishment to mimic the simplest living cell. Are biological nanomachines, then, the end of the line? Are they the most highly optimized structures that can exist, and has evolution sorted through all possibilities to arrive at the best one? We have no general answer to this question. Jeremy R. Knowles of Harvard University has established that one enzyme--triose phosphate isomerase, or TIM--is "perfect": that is, no catalyst for the particular reaction catalyzed by this enzyme could be better. For most enzymes, and all structures more complicated than enzymes, we have made no effort to discover the alternatives. Biological structures work in water, and most work only in a narrow range of temperatures and concentrations of salts. They do not, in general, conduct electricity well (although some, such as the chloroplast and the mitochondrion, move electrons around with great sophistication). They do not carry out binary computation and communications. They are not particularly robust mechanically. Thus, a great many types of function must be invented if nanomachines are to succeed in nonbiological environments. And what have we learned from all this about the doomsday scenario of gray goo? If a hazard were to arise from nanomachines, it would lie in a capability for self-replication. To be self-replicating, a system must contain all the information it needs to make itself and must be able to collect from its environment all the materials necessary both for energy and for fabrication. It must also be able to manufacture and assemble (or allow to assemble) all the pieces needed to make a copy of itself. Biology has solved all these problems, and self-replicating biological systems--from pathogenic bacteria to cancer cells--are a danger to us. In computer systems, self-replicating strings of bits (computer viruses), although not material objects, are also at least a great nuisance, but only indirectly a danger, to us. If a new system--any system--were able to replicate itself using materials present in the environment, it would be cause for concern. But we now know enough to realize how far we are from reproducing self-replication in a nonbiological system. Fabrication based on the assembler is not, in my opinion, a workable strategy and thus not a concern. For the foreseeable future, we have nothing to fear from gray goo. If robust self-replicating micro (or perhaps nano) structures were ultimately to emerge, they would probably be chemical systems as complex as primitive bacteria. Any such system would be both an incredible accomplishment and a cause for careful assessment. Any threat will not be from assemblers gone amok but from currently unimaginable systems of self-catalyzing reactions. So biology and chemistry, not a mechanical engineering textbook, point in the direction we should look for answers--and it is also where our fears about organisms or devices that multiply uncontrollably are most justified. In thinking about self-replication, and about the characteristics of systems that make them "alive," one should start with biology, which offers a cornucopia of designs and strategies that have been successful at the highest levels of sophistication. In tackling a difficult subject, it is sensible to start by studying at the feet of an accomplished master. Even if they are flagella, not feet. © 1996-2004 Scientific American, Inc. All rights reserved.